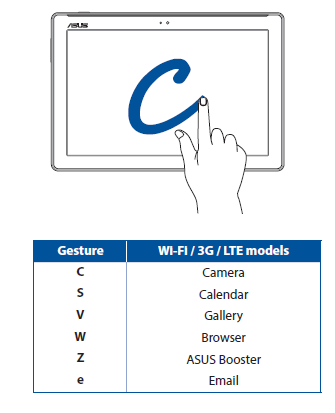 The ASUS ZenPad 10 ‏Z300C pdf manual contains 166 pages. It's devided into 11 section with index. This manual provide many important information such as learn device layout with part and key functions, tutorial instaling a memory card, installing a micro SIM card, using Asus mobile dock,using bluetooth, using special keys, unlocking tablet guide, using the touchscreen. Then about zenmotion, using home screen, widgets, setting up date and time, wallpaper, lock screen guide, managing contacts, setting up ptofile and VIPS, tutorial importing and exporting contacts, using camera, gallery, browser, email, using supernote, file manager, accessing cloud storage, setting bluetooth and wi-fi also tethering. Other information in the ASUS ZenPad 10 user guide such as using maps, zenlink, using special zen tools like audio wizard and splendid, updating guide, backup, reset also securing.